Goodreads summary: You take it for granted. Waking up. Going to school, talking to your friends. Watching a show on television or reading a book or going out to lunch. But now — now I am remembering. For all of her seventeen years, Molly feels like she’s missed bits and pieces of her life. Now, she’s figuring out why. Now, she’s remembering her own secrets. And in doing so, Molly uncovers the separate life she seems to have led... and the love that she can’t let go. So at first glance I thought this would be a paranormal read, but it's actually contemporary, which I was kinda glad to know about before I went in, because it's a bit of an adjustment in expectations. 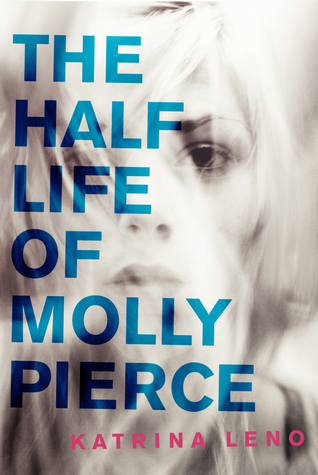 The Half Life of Molly Pierce is a fast read, I breezed through it in a couple of hours and Katrina Leno's writing style made it easy for me to do this. It's interesting and I did want to know what was going on, but in the end I wasn't all that invested in the story. I really want to recommend another book if this is your kind of thing, but I'm afraid to spoil things for you, so if you do want to know, just tweet me and I'll tell you what book I'm talking about (@DBetweenpages). There's a whole lof of confusion and a whole lot of stuff that is messed up and that I went WTF about, but it all adds up and I liked it. One thing I really liked was seeing how everybody else was handling Molly's blackouts (I don't really know what else to call them) and especially her sister, her sister is awesome. I'm being cryptic, I know, but bottom line: I liked it, but it didn't blow me away, but it also took me no time at all to read it, so it was ok.
Hmm. I read only one other review of this, and it seems like it's a definite 3-star one. I'm not a big fan of amnesia-ish narratives (unreliable narrators are super clever, but reallllllllyyyyyy annoying) but the cover looks intriguing.